With so much written about the Eurozone economy in the last few years, it is almost impossible to understand what is really going on. This table is my effort to put it all together in simple terms. Here is how to read the table. Each row represents a Eurozone country, and the countries are sorted according to their GDP in 2012 relative to 2007. So the first country on the table is Slovakia, whose real GDP in 2012 was 10.52% higher than in 2007. 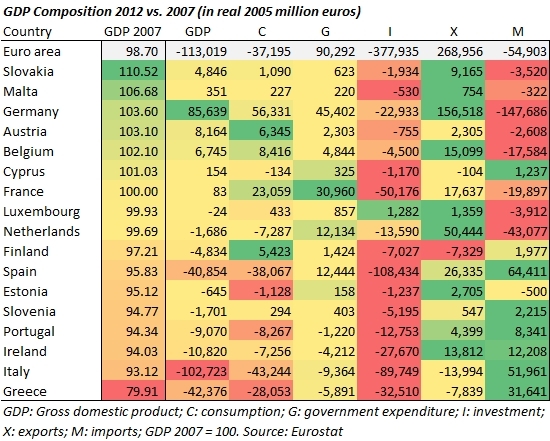 Slovakia’s economy has had the best performance in the Eurozone according to this measure (real GDP vs. 2007). The last country on the list Greece—its GDP was 20% below its 2007 level. The heat map (green-yellow-red) is intuitive: better performance means green; lower means red. The heat map differs for each column. In the third column (GDP), the green-yellow-red designation represents the intensity across the column, which is why two numbers (Germany’s 85,639 and Italy’s 102,723) are the only ones that show up—they are just that much bigger than every other number. However, for the rest of the table, the green-yellow-red designation is row-specific, meaning that in the first country row (Slovakia), the largest number (9,165) shows up as green because it is the largest number among C, G, I, X and M for that country—even though there are other numbers on its column that are much greater. First, which countries in the Eurozone have done better than others? Second, why? Has their economic performance been driven by consumption, government spending, investment, or trade? And third, what are the biggest changes that are impacting the whole Eurozone? This table offers a clear answer to all three questions. First, of the 17 countries in the Eurozone, ten had a GDP in 2012 that was below its 2007 level (in real terms)—in the other seven countries, GDP was higher, and in the smaller economies of Slovakia and Malta, it was significantly higher. In Germany, Austria and Belgium, GDP was 2.1 to 3.6% higher in 2012 versus 2007. On the other end of the spectrum, Greece’s GDP was 20% below its 2007 level, by far the worst performance in the Eurozone. Another batch of countries (Italy, Ireland, Portugal, and Slovenia) had a GDP level that was 5% or worse relative to 2007. This distribution is interesting, of course, but it does not tell us the why. For that we have to look at the rest of the table. The analytical process here is to look at each row and see where the greens are—that way we can understand, in each country, what drove economic performance. There is, however, one caveat: when looking exports, one should look at imports as well. Germany is a good example of why this is the case. Germany’s real GDP rose by €85.6 billion from 2007 to 2012. If one looks across the row on Germany, the most important driver for GDP was exports, which increased by €156 billion. However, the country also imported an additional €147.7 billion in goods and services. On a net basis, trade contributed a mere €8.8 billion. In other words, Germany’s strong export position, which is normally credited for the country’s superior performance, made little contribution to GDP growth in this period. Instead, the main drivers were private and government consumption (plus €56 and €45 billion, respectively). Investment actually declined between 2007 and 2012, reflecting a broader Eurozone pattern (more on that below). There is no need to go line-by-line but let’s focus briefly on each country where GDP was higher in 2012 versus 2007 (Slovakia to France). In this list of seven countries, only in three (Slovakia, Malta, Cyprus) did net exports represent the dominant source of economic performance. In the other four countries (Germany, Austria, Belgium and France) domestic consumption was a far more important driver. Also noteworthy is that investment declined in every single country in that period. The idea, therefore, that GDP growth in the Eurozone somehow depends on external competitiveness and that net export growth is the key does not hold true across the countries whose performance was best in the Eurozone in this five-year period. Let’s us now look at the countries below the 2007=100 line (Luxemburg through Greece) and stay on this theme of export competitiveness. Of those ten countries, seven were able to boost exports in real terms relative to their pre-crisis levels in 2007. The only countries that have been unable to export as much as they did in 2007 were Finland, Italy and Greece—in every other country, exports were higher than in 2007. If one includes imports, in eight out of the ten countries, the trade balance made a positive contribution to GDP either because exports rose, or because imports declined or both. Being able to (net) export more, therefore, was no promise of being able to avoid a recession (more on this later). Look at Spain, for example. Its exports were €26.3 bn higher and its imports were €64.4 billion lower between 2007 and 2012. Those numbers represent a 10% increase in real exports and a 20% decline in real imports. This change in its external position has made a remarkable contribution to a country whose 2012 GDP was €938 billion (in real, 2005 euros). Yet this change in net trade has been paltry relative to the complete collapse of investment by €108 billion (minus 36% in real terms). Of course, the decline in investment is mostly (87%) due to construction. It is, in other words, a pretty natural correction from the pre-crisis bubble. The final part of the puzzle has been a decline in consumption, which is partly the result of unemployment and partly the result of higher taxation (including VAT increases). Ireland shows a similar pattern. Investment has fallen by €27.6 billion, which marks a 58% real decline! But this too is a real-estate correction: between 2002 and 2007, real investment increased by 45%, and 88% of the drop in investment came from construction. Similar to Spain, however, Ireland’s external position has cushioned the impact of declining investment (and consumption). The country’s net gain of €26 billion in trade has almost singlehandedly offset the drop in investment, meaning that the magnitude of the GDP decline is, more or less, equal to the decline in consumption. In Italy, the dynamics are slightly different. First, this is one of the three countries where exports have yet to reach their 2007 levels. But this result is mostly due to a sharp drop in exports in 2009 (minus €72 billion). Since 2009, the country’s exports have been rising steadily, just not fast enough to return to their 2007 levels. The country’s imports, however, show a different trajectory as the sharp contraction (minus €52 billion) has provided a boon to GDP. However, Italy’s problem is investment. Unlike Spain and Ireland, however, the decline in investment is attributable mostly to business investment for equipment (57% of the total)—the balance is driven by construction. And in Italy too, there has been a sharp decline in consumption, coming almost entirely in 2012. Portugal looks similar to Ireland. The change in net trade (€12.7 billion) more or less offsets the decline in investment—and the GDP drop, then, comes from lower consumption. As in the other countries with real-estate bubbles, the majority of the drop (63%) came from construction, although less than in Spain (87%) or Ireland (88%). Greece stands out in this peer group in several ways. First, it is, by far, the worst performer since 2007. Second it has only one bright spot (lower imports), making it one of two countries where only one item in this balance is positive (the other country is Italy). In Greece, the recession has been driven almost equally between investment and consumption—the former can be attributed in part to construction (70% of the drop) and the latter to unemployment and rising taxes. Having looked at individual countries, let us step back and look at the Eurozone-wide picture. First, it is obvious that the drop in GDP is really a factor of Germany growing (+€85 billion) but without a supporting cast to offset the declines in Italy (-€102 billion), Spain (-40 billion) and Greece (€42 billion). On a net basis, Italy’s decline accounts for the bulk of the decline in the overall Eurozone—Germany’s gain offsets the decline in Greece and Spain, and the rest of the union is more or less even. Second, the Eurozone has a clear investment problem: investment rose in only one of the 17 countries (Luxemburg). Yet looking at the countries with the sharpest declines in investment, the problem seems to be a correction from a real-estate bubble before the crisis. Only in Italy and Germany does there seem to be a business investment problem. This is something to pay close attention to. Third, external competitiveness gets undue focus. For the seven countries whose 2012 GDP was higher than in 2007, net exports made a big difference in only three cases; of the ten countries where GDP declined, net trade made a material contribution in seven, but this was not enough to offset the decline in investment. In other words, their problem is not external competitiveness but investment—unless one thinks that exports should have boomed enough to completely absorb the bursting of a real-estate bubble, which is unrealistic. Fourth and final, this reading supports the thesis that, in many ways, this is a very conventional crisis. Several countries suffered from a pre-crisis real-estate bubble. Exports are rising despite the claims that within the common currency, export competitiveness is somehow a function of “internal devaluation” (there was little correlation between export growth and unit labor costs changes). Countries are facing budgetary pressures that they have to cope with, yes; they have to digest the implications of burst bubbles, yes; and they have to make structural reforms, yes. 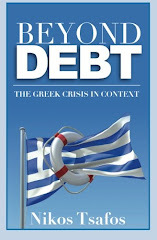 What’s new about all that which relegates the Eurozone crisis to requiring a completely different analytical lens? Absolutely nothing, except excited economists who do not want to bother to look at data. Interesting, but I have a suggestion - you have imports as they contribute to GDP, not as a difference from 07. I was very confused to see +31 imports for Greece! So either correct this or correct the text where you mention how the cells were calculated. Good call--changed the text. Sorry about that. Nice work. I know that this site is called GreekDefaultWatch and not WorldDefaultWatch, but I think that the same analysis for the rest of the EU, other important European countries (Switzerland, Norway), and the US and Japan, would be instructive. The fact that their currencies differ doesn't matter if the analysis is done in real terms, like you have done above. My suspicion is that they will all show a collapse in investment, just like the Eurozone. Its interesting that many recommend boosting household and government consumption in a recession, but it is usually a collapse in investment that causes a recession. In which case, reducing business costs (through lower taxes and/or structural reforms) would target the cause and be more effective. One other point stands out in your table: the almost complete absence of a link between reductions in government spending and reductions in GDP. So despite the noise about austerity and how it has caused recessions in Eurozone countries, hardly any government has practiced austerity but people argue/demonstrate against it. You have already made this point about Greece but the table confirms that this is also the case in other Eurozone countries. The investment problem is pretty clear from the table, yes. At an anecdotal level, I can see it playing out here in germany. There's endless discussions about where to invest, to get at least a real zero return. And nobody has a good answer. Sovereign Bonds? Either too risks, or negative returns. Property? Prices in the countryside are still falling steeply, and in the big cities supply is very limited. Gold? Hey, it's Germany, Gold always has takers. Demand shot up, when the price recently fell. Company Stock? Risky, it looks like a bubble, to a conservative german investor, even as the DAX goes higher and higher. The thing is (this would be my summary of a lot of interviews with finance directors of big insurance companies, and similar) with the sudden loss of the notional zero-risk option (eurozone sovereign bonds), all the big institutional investors are still scratching their heads trying to work out a new way of mapping increasing risk to increasing returns. They're having to tear up and re-work their whole notion of risk modelling, now the penny appears to have finally dropped, that debt mutualisation isn't going to happen.